Você sabe como falar as horas em inglês da 1 hora até a 1 e 59 minutos? Quer aprender? Então siga abaixo, pois montamos uma tabela completa com todas as horas em inglês por extenso dentro do período da 01:00 a 01:59. Em cada horário, ou seja, cada minuto em inglês, iremos aprender diversas possibilidades de como dizer as horas em inglês. Então vamos logo começar a lição. Mas antes, baixe o Anki aí no seu computador ou celular e insira os nomes que você estiver com dificuldade de memorizar. Essa incrível ferramenta vai te ajudar a gravar esses nomes mais facilmente em um processo de Spaced Repetition (Repetição Espaçada). Acesse aqui e conheça mais sobre o Anki. Vamos começar aprendendo na tabela abaixo como escrever as horas em inglês por extenso do período 01:00 a 01:14. E lembrando que o termo “o’clock” (em ponto) só é usado para horas exatas. One minute past one One minute past one a.m.
One past one One past one a.m.
Fifty-nine minutes to two Fifty-nine minutes to two a.m.
One one One one a.m.
Two minutes past one Two minutes past one a.m.
Two past one Two past one a.m.
Fifty-eight minutes to two Fifty-eight minutes to two a.m.
One two One two a.m.
Three minutes past one Three minutes past one a.m.
Three past one Three past one a.m.
Fifty-seven minutes to two Fifty-seven minutes to two a.m.
One three One three a.m.
Four minutes past one Four minutes past one a.m.
Four past one Four past one a.m.
Fifty-six minutes to two Fifty-six minutes to two a.m.
One four One four a.m.
Five minutes past one Five minutes past one a.m.
Five past one Five past one a.m.
Fifty-five minutes to two Fifty-five minutes to two a.m.
One five One five a.m.
Six minutes past one Six minutes past one a.m.
Six past one Six past one a.m.
Fifty-four minutes to two Fifty-four minutes to two a.m.
One six One six a.m. Seven minutes past one Seven minutes past one a.m. Seven past one Seven past one a.m.
Fifty-three minutes to two Fifty-three minutes to two a.m.
One seven One seven a.m. Eight minutes past one Eight minutes past one a.m. Eight past one Eight past one a.m.
Fifty-two minutes to two Fifty-two minutes to two a.m.
One eight One eight a.m.
Nine minutes past one Nine minutes past one a.m.
Nine past one Nine past one a.m.
Fifty-one minutes to two Fifty-one minutes to two a.m.
One nine One nine a.m. Ten minutes past one Ten minutes past one a.m. Ten past one Ten past one a.m.
Fifty minutes to two Fifty minutes to two a.m.
One ten One ten a.m.
Eleven minutes past one Eleven minutes past one a.m.
Eleven past one Eleven past one a.m.
Forty-nine minutes to two Forty-nine minutes to two a.m.
One eleven One eleven a.m.
Twelve minutes past one Twelve minutes past one a.m.
Twelve past one Twelve past one a.m.
Forty-eight minutes to two Forty-eight minutes to two a.m.
One twelve One twelve a.m.
Thirteen minutes past one Thirteen minutes past one a.m.
Thirteen past one Thirteen past one a.m.
Forty-seven minutes to two Forty-seven minutes to two a.m.
One thirteen One thirteen a.m.
Fourteen minutes past one Fourteen minutes past one a.m.
Fourteen past one Fourteen past one a.m.
Forty-six minutes to two Forty-six minutes to two a.m.
One fourteen One fourteen a.m.
Fifteen minutes past one Fifteen minutes past one a.m.
Fifteen past one Fifteen past one a.m.
Forty-five minutes to two Forty-five minutes to two a.m.
One fifteen One fifteen a.m.
A quarter past one A quarter past one a.m.
Sixteen minutes past one Sixteen minutes past one a.m.
Sixteen past one Sixteen past one a.m.
Forty-four minutes to two Forty-four minutes to two a.m.
One sixteen One sixteen a.m.
Seventeen minutes past one Seventeen minutes past one a.m.
Seventeen past one Seventeen past one a.m.
Forty-three minutes to two Forty-three minutes to two a.m.
One seventeen One seventeen a.m.
Eighteen minutes past one Eighteen minutes past one a.m.
Eighteen past one Eighteen past one a.m.
Forty-two minutes to two Forty-two minutes to two a.m.
One eighteen One eighteen a.m.
Nineteen minutes past one Nineteen minutes past one a.m.
Nineteen past one Nineteen past one a.m.
Forty-one minutes to two Forty-one minutes to two a.m.
One nineteen One nineteen a.m.
Twenty minutes past one Twenty minutes past one a.m.
Twenty past one Twenty past one a.m.
Forty minutes to two Forty minutes to two a.m.
One twenty One twenty a.m.
Twenty-one minutes past one Twenty-one minutes past one a.m.
Twenty-one past one Twenty-one past one a.m.
Thirty-nine minutes to two Thirty-nine minutes to two a.m.
One twenty-one One twenty-one a.m.
Twenty-two minutes past one Twenty-two minutes past one a.m.
Twenty-two past one Twenty-two past one a.m.
Thirty-eight minutes to two Thirty-eight minutes to two a.m.
One twenty-two One twenty-two a.m.
Twenty-three minutes past one Twenty-three minutes past one a.m.
Twenty-three past one Twenty-three past one a.m.
Thirty-seven minutes to two Thirty-seven minutes to two a.m.
One twenty-three One twenty-three a.m.
Twenty-four minutes past one Twenty-four minutes past one a.m.
Twenty-four past one Twenty-four past one a.m.
Thirty-six minutes to two Thirty-six minutes to two a.m.
One twenty-four One twenty-four a.m.
Twenty-five minutes past one Twenty-five minutes past one a.m.
Twenty-five past one Twenty-five past one a.m.
Thirty-five minutes to two Thirty-five minutes to two a.m.
One twenty-five One twenty-five a.m.
Twenty-six minutes past one Twenty-six minutes past one a.m.
Twenty-six past one Twenty-six past one a.m.
Thirty-four minutes to two Thirty-four minutes to two a.m.
One twenty-six One twenty-six a.m.
Twenty-seven minutes past one Twenty-seven minutes past one a.m.
Twenty-seven past one Twenty-seven past one a.m.
Thirty-three minutes to two Thirty-three minutes to two a.m.
One twenty-seven One twenty-seven a.m.
Twenty-eight minutes past one Twenty-eight minutes past one a.m.
Twenty-eight past one Twenty-eight past one a.m.
Thirty-two minutes to two Thirty-two minutes to two a.m.
One twenty-eight One twenty-eight a.m.
Twenty-nine minutes past one Twenty-nine minutes past one a.m.
Twenty-nine past one Twenty-nine past one a.m.
Thirty-one minutes to two Thirty-one minutes to two a.m.
One twenty-nine One twenty-nine a.m.
Thirty minutes past one Thirty minutes past one a.m.
Thirty past one Thirty past one a.m.
Thirty minutes to two Thirty minutes to two a.m.
One thirty One thirty a.m.
Half past one Half past one a.m.
Thirty-one minutes past one Thirty-one minutes past one a.m.
Thirty-one past one Thirty-one past one a.m.
Twenty-nine minutes to two Twenty-nine minutes to two a.m.
One thirty-one One thirty-one a.m.
Thirty-two minutes past one Thirty-two minutes past one a.m.
Thirty-two past one Thirty-two past one a.m.
Twenty-eight minutes to two Twenty-eight minutes to two a.m.
One thirty-two One thirty-two a.m.
Thirty-three minutes past one Thirty-three minutes past one a.m.
Thirty-three past one Thirty-three past one a.m.
Twenty-seven minutes to two Twenty-seven minutes to two a.m.
One thirty-three One thirty-three a.m.
Thirty-four minutes past one Thirty-four minutes past one a.m.
Thirty-four past one Thirty-four past one a.m.
Twenty-six minutes to two Twenty-six minutes to two a.m.
One thirty-four One thirty-four a.m.
Thirty-five minutes past one Thirty-five minutes past one a.m.
Thirty-five past one Thirty-five past one a.m.
Twenty-five minutes to two Twenty-five minutes to two a.m.
One thirty-five One thirty-five a.m.
Thirty-six minutes past one Thirty-six minutes past one a.m.
Thirty-six past one Thirty-six past one a.m.
Twenty-four minutes to two Twenty-four minutes to two a.m.
One thirty-six One thirty-six a.m.
Thirty-seven minutes past one Thirty-seven minutes past one a.m.
Thirty-seven past one Thirty-seven past one a.m.
Twenty-three minutes to two Twenty-three minutes to two a.m.
One thirty-seven One thirty-seven a.m.
Thirty-eight minutes past one Thirty-eight minutes past one a.m.
Thirty-eight past one Thirty-eight past one a.m.
Twenty-two minutes to two Twenty-two minutes to two a.m.
One thirty-eight One thirty-eight a.m.
Thirty-nine minutes past one Thirty-nine minutes past one a.m.
Thirty-nine past one Thirty-nine past one a.m.
Twenty-one minutes to two Twenty-one minutes to two a.m.
One thirty-nine One thirty-nine a.m.
Forty minutes past one Forty minutes past one a.m.
Forty past one Forty past one a.m.
Twenty minutes to two Twenty minutes to two a.m.
One forty One forty a.m.
Forty-one minutes past one Forty-one minutes past one a.m.
Forty-one past one Forty-one past one a.m.
Nineteen minutes to two Nineteen minutes to two a.m.
One forty-one One forty-one a.m.
Forty-two minutes past one Forty-two minutes past one a.m.
Forty-two past one Forty-two past one a.m.
Eighteen minutes to two Eighteen minutes to two a.m.
One forty-two One forty-two a.m.
Forty-three minutes past one Forty-three minutes past one a.m.
Forty-three past one Forty-three past one a.m.
Seventeen minutes to two Seventeen minutes to two a.m.
One forty-three One forty-three a.m.
Forty-four minutes past one Forty-four minutes past one a.m.
Forty-four past one Forty-four past one a.m.
Sixteen minutes to two Sixteen minutes to two a.m.
One forty-four One forty-four a.m.
45 minutos em inglês é frequentemente representado pelo termo “a quarter to” (quinze para / um quarto passado). 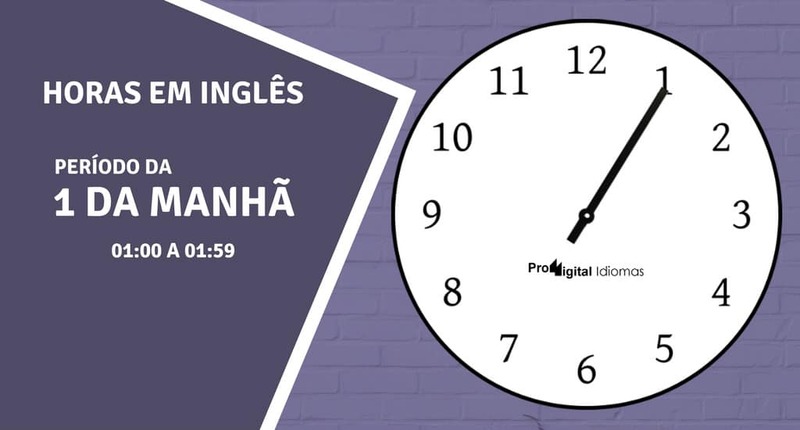 Vamos ver abaixo como falar as horas em inglês do 45 minutos em diante (01:45 a 01:59). Forty-five minutes past one Forty-five minutes past one a.m.
Forty-five past one Forty-five past one a.m.
Fifteen minutes to two Fifteen minutes to two a.m.
One forty-five One forty-five a.m.
A quarter to two A quarter to two a.m.
Forty-six minutes past one Forty-six minutes past one a.m.
Forty-six past one Forty-six past one a.m.
Fourteen minutes to two Fourteen minutes to two a.m.
One forty-six One forty-six a.m.
Forty-seven minutes past one Forty-seven minutes past one a.m.
Forty-seven past one Forty-seven past one a.m.
Thirteen minutes to two Thirteen minutes to two a.m.
One forty-seven One forty-seven a.m.
Forty-eight minutes past one Forty-eight minutes past one a.m.
Forty-eight past one Forty-eight past one a.m.
Twelve minutes to two Twelve minutes to two a.m.
One forty-eight One forty-eight a.m.
Forty-nine minutes past one Forty-nine minutes past one a.m.
Forty-nine past one Forty-nine past one a.m.
Eleven minutes to two Eleven minutes to two a.m.
One forty-nine One forty-nine a.m.
Fifty minutes past one Fifty minutes past one a.m.
Fifty past one Fifty past one a.m. Ten minutes to two Ten minutes to two a.m.
One fifty One fifty a.m.
Fifty-one minutes past one Fifty-one minutes past one a.m.
Fifty-one past one Fifty-one past one a.m.
Nine minutes to two Nine minutes to two a.m.
One fifty-one One fifty-one a.m.
Fifty-two minutes past one Fifty-two minutes past one a.m.
Fifty-two past one Fifty-two past one a.m. Eight minutes to two Eight minutes to two a.m.
One fifty-two One fifty-two a.m.
Fifty-three minutes past one Fifty-three minutes past one a.m.
Fifty-three past one Fifty-three past one a.m. Seven minutes to two Seven minutes to two a.m.
One fifty-three One fifty-three a.m.
Fifty-four minutes past one Fifty-four minutes past one a.m.
Fifty-four past one Fifty-four past one a.m.
Six minutes to two Six minutes to two a.m.
One fifty-four One fifty-four a.m.
Fifty-five minutes past one Fifty-five minutes past one a.m.
Fifty-five past one Fifty-five past one a.m.
Five minutes to two Five minutes to two a.m.
One fifty-five One fifty-five a.m.
Fifty-six minutes past one Fifty-six minutes past one a.m.
Fifty-six past one Fifty-six past one a.m.
Four minutes to two Four minutes to two a.m.
One fifty-six One fifty-six a.m.
Fifty-seven minutes past one Fifty-seven minutes past one a.m.
Fifty-seven past one Fifty-seven past one a.m.
Three minutes to two Three minutes to two a.m.
One fifty-seven One fifty-seven a.m.
Fifty-eight minutes past one Fifty-eight minutes past one a.m.
Fifty-eight past one Fifty-eight past one a.m.
Two minutes to two Two minutes to two a.m.
One fifty-eight One fifty-eight a.m.
Fifty-nine minutes past one Fifty-nine minutes past one a.m.
Fifty-nine past one Fifty-nine past one a.m.
One minute to two One minute to two a.m.
One fifty-nine One fifty-nine a.m.
E essas são todas as horas em inglês por extenso dentro do período da 1 hora da manhã (madrugada). Não deixe de revisa-las periodicamente essa tabela para estar sempre relembrando as formas de escrita das horas em inglês. Não há a necessidade de memoriza-las todas de uma só vez. Faça um processo de revisão em semanas diferentes (use o Anki para isso) e com o tempo você irá gravar as possíveis estruturas de cada horário. E aí o que acho da tabela? Conhece mais alguma forma de como escrever as horas em inglês? Conte para nós nos comentários abaixo. Thanks!